The historic Cornwall Canal is set to come alive once again on Saturday, August 10th with the return of Cornwall Waterfest. 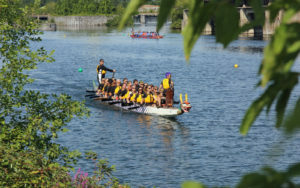 A staple of Cornwall’s summer events calendar, Waterfest offers a mix of festivities, food, live entertainment and, of course, the popular dragon boat races. Registration for the dragon boat races is now open and interested teams are encouraged to register early. The cost of registering a team is $840 which amounts to $40 for each of the 21 participant’s team members. There is both a Community and Sport division to encourage people of all skill levels to participate. Every local team will be given the opportunity to practice prior to the event. There are also two racing divisions to suit every team’s needs. The Community Division offers a chance for those seeking a friendly type of competition, while the Sport Division offers a chance for those seeking more of a challenge. For the first time last year, the Cornwall Waterfest awarded trophies in a Ladies’ Division. Organizers are also encouraging youth teams to get involved. The deadline for registration is July 10th. Along with the races, there will be food and drink vendors, a market featuring local artisans, and homegrown live entertainment performing on the Waterfest stage. The activities are based near the western end of the canal near Power Dam Drive and Second Street West. A portion of the proceeds from the event will go to Hospice Cornwall. There are multiple other ways to donate to this year’s charity, including a silent auction, 50/50 draw and collecting pledges. For additional information on the event, registering a team, sponsorship or becoming a vendor, please visit the Cornwall Waterfest website.